We have found out that CherryTrade has shut down their operations. 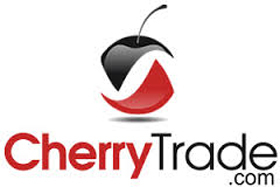 We found CherryTrade to be a very interesting binary options trading broker. They had a lot of good things to offer their many traders and the overall quality of the website was good. They seemed to bring an easy to use platform to the trading table and strive to do it at a reasonable cost. This trading site has operated since 2013 out of Anguilla and has been steadily gaining in popularity ever since. Let’s take a look at CherryTrade a little more closely. It seems to us that CherryTrade has plenty of trading options and they make it very easy to place trades based on those options. 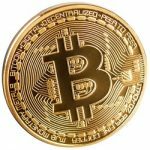 The options seem to run on some very sophisticated technologies which we think will give investors a good chance to profit by using their website. They have some excellent learning tools and the site seems to believe that knowledge is power when it comes to being successful at binary options trading. It also features a wide variety of account selections with some nice perks as you go up in level. The bonuses that a trader gets with CherryTrade are not bad at all when you compare them to some other brokers. It all starts with a generous sign up bonus that the user gets when they make their initial deposit and complete a few trades. Like many brokers, the bonus increases based on the amount of your initial deposit, so the higher amount you deposit upon sign up, the more ‘free money’ you will get to trade with. The minimum deposit on CherryTrade is $200 and a user must trade thirty times their initial deposit in order to withdraw any and or all of their bonus money. The max bonus payable is a nice $20,000. So make sure if you want to trade with them, you deposit as much as you can initially to take full advantage of the sign up bonus. CherryTrade is also very fair when it comes to account payouts. As a matter of fact, returns on investment of around 85% are not uncommon for traders on the website. That allows all the users of the site to make some nice profit on the successful trades that they place. They feature a very low minimum investment of $5 and a maximum investment of $1000; that makes it easy for an investor to trade an amount based on how strongly they feel about an asset trending in their preferred direction. 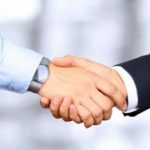 When it comes to account variety, CherryTrade has an excellent list of choices and some unique features that come with each level account. The account level a user enters into the site at is based on the total amount of the initial deposit. Just like with the sign up bonus, a trader gets a lot more perks with the more money they deposit initially. It all starts with the CherryTrade Classic account which is the lowest account level and only requires the site minimum deposit of $200. Anyone who deposits between $200 – $499 will enter into to the site as a classic level trader and will also receive a sign up bonus of 25% of their initial deposit. They will also receive CherryTrade’s daily and weekly market analysis as an added bonus. Next up in levels is the CherryTrade Bronze account. This level is achieved by making an initial deposit of $500 – $999 and it offers a nice 35% initial sign up bonus at this level. As with all higher level accounts, it gives the trader all the perks of the lower levels plus more. This level includes four risk free trades and access to weekly phone trading sessions. We liked what the CherryTrade Silver account had to offer when we tested the website. There is a very generous sign up bonus of 50% for any investor that makes an initial deposit of $1000 – $4999. Silver account status also allows the trader to make four $50 risk free trades and supplies them with some nice auto trading signals. We highly recommend this account level if you want a nice, well informed trading experience. Next comes an account for an investor that takes their trading very seriously and wants to learn all they can about binary options trading; it’s called the CherryTrade Gold account. This level is given to a trader that deposits $5000 – $9999 in their account to start.It not only gives the trader a nice sign up bonus of 75%, but it also gives them a 50% bonus on subsequent deposits; that is one heck of a deal by any binary option brokers standards. It includes four risk free trades of $250, 3 months of free signals analysis, free trade alerts, weekly technical analysis trading sessions, assignment of a personal account manager and an unheard of 10% monthly insurance against losses. The ultimate trading level on CherryTrade is the CherryTrade Diamond account which not only offers all of the features available to the other account levels, but it also offers a great 100% sign up bonus and four risk free $500 trades. There really is a nice variety of account levels on CherryTrade. 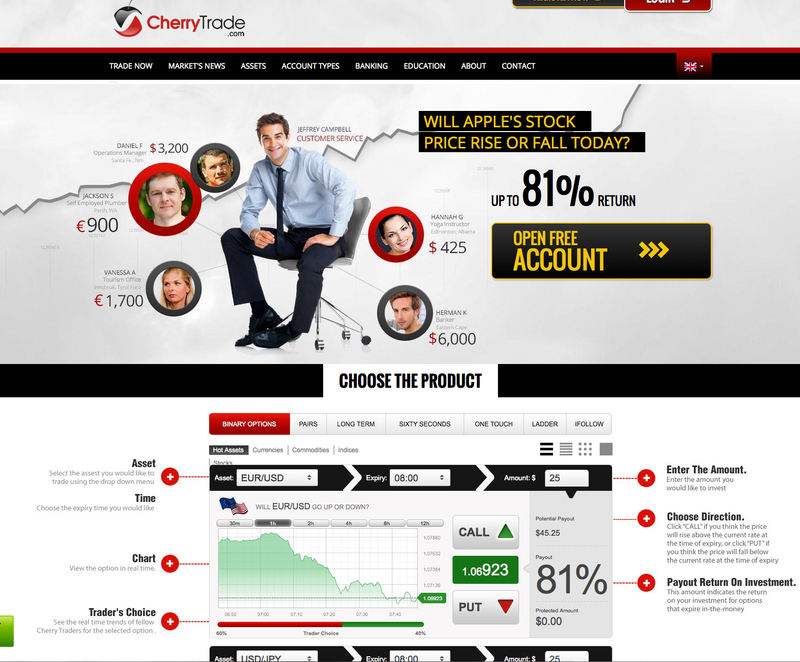 There is a lot of diversity when it comes to CherryTrade’s easy to use web trading platform. We found it very easy to navigate around the website by using its many point and click features. It is a system that runs well even when there are a lot of memory strains in place while using the platform. SpotOption is the software that CherryTrade runs on. It runs in a traditional graphic window based system that features a really clear and useful layout. It nicely displays all the settings and menu selections where the trader can clearly see them. The payout and return on investment ratios are also nice displayed to the side of the screen. There is even a handy trading sentiment indicator for the asset that is being displayed. CherryTrade can also have multiple windows running at the same time so users can keep abreast of more than one asset to trade. That is a nice little feature, especially if you are trading on short time frames. When using the site we found that the list of tradable assets was very small indeed, but some of this is compensated for by the fact that they have selected assets that are very stable in the trading market place. Among their asset selections are a mixture of stocks, indices, commodities and currencies. Despite having only a small amount of assets to trade, they do have a large variety of binary options to choose from. 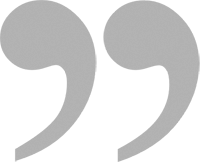 These consist of such options as High/Low options, One Touch options, 60 second options, Long Term options, matched pair options and the unique ladder options. When using the website we really found it very user friendly when it came to making trades. As an indication of how much CherryTrade is in to educating their many users, you will see a convenient drop down menu after clicking on the learning tools tab. The drop down menu features a wide variety of learning choices. As much as they are into helping their traders learn, we were extremely surprised and disappointed to find that they did not offer a demo trading account when we looked at the website. Banking is not a problem when conducting trading on CherryTrade, despite the fact that they only offer accounts in US Dollars or Euros. They accept deposit and withdrawals by using Visa, MasterCard, Amex, bank wire transfers, Maestro, Visa Electron and other methods; so they conveniently provide their users with a lot of variety here. The banking service was pretty fast, but we also noticed there were a lot of additional fees in some cases, especially as they pertained to bank wire transfers. The cash out time in most cases was an acceptable 3 days and the minimum withdrawal is $100. Cherry trade has a nice little customer service center that features access numbers in a lot of different countries. They can be contacted by using the phone, e-mail and live chat. Customer service is available in some form 24/7. It was a little surprising that the only supporting language was English. For those users that have a personal account manager, they can be contacted by using Skype. One of the features we did not like about the site was the fact that the customer support tab was almost hidden and it took us a while to find it; something as important as that would make traders more comfortable if it was displayed more prominently. We found CherryTrade to be at the end of spectrums when it came to what we liked and disliked while testing the site. 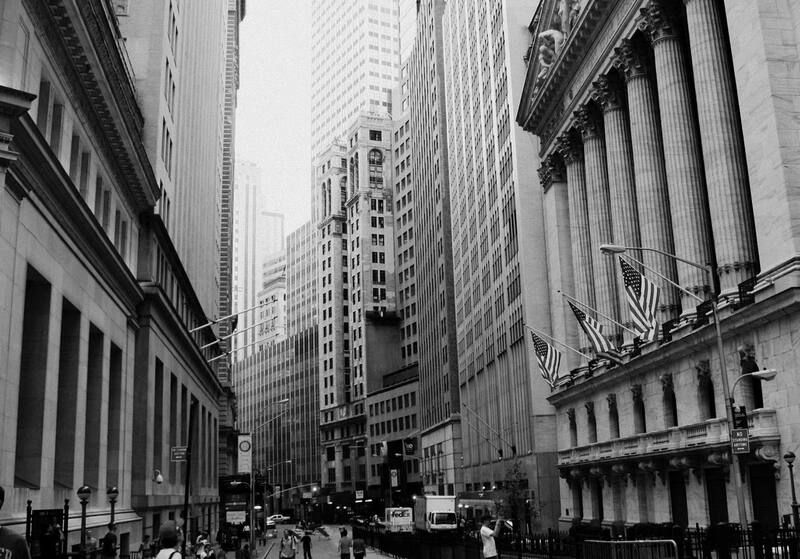 They have a large variety of trading options offered, but they don`t have a demo account. End of the day, you will definitely get a good and profitable trading experience trading with CherryTrade. We highly recommend them for all levels of traders. This broker is also found on Binary Option Robot. 7 Binary Options review: CherryTrade: 4,5 stars.